With the temperatures already rising in the spring season, there are several ways to prepare for the heat and maintain your low air conditioning costs. Although it can be difficult to spend less when trying to stay cool indoors, there are several ways to reduce the energy bill for a cost that is 43 percent of the monthly utility bill. Practice a few habits that are recommended to save more as the summer season approaches. Keeping the thermostat set at 78 degrees will prevent using the air conditioner more than needed for a comfortable climate within the home. It will also make it easy to forget about during the day. Add more shade to your indoor environment by planting several large trees that can shade the windows. The step is eco-friendly and will also prevent heat from accumulating through the roof. 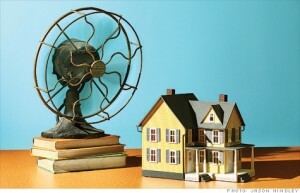 Keep the air circulating with fans that are placed away from closed windows and in the second level of the property. Cooking hearty casseroles in the oven or making mac and cheese on the stove can make for a tasty dinner, but will also heat up the home. Opt for using the microwave and choose chilled meals instead. Hire a professional to inspect your air conditioner to ensure that it’s functioning properly and maintains a high-energy efficiency. A technician from a local company or Nu-Temp Associates Heating & Cooling will be able to assess the unit and replace it if necessary. Mesh window screens are easy to install and are also affordable to purchase for a product that blocks up to 70 percent of solar energy. Window film can also be applied for an effective way of reflecting the heat. The lighting in your home can release heat and increase the dependency on air conditioning. Replace all incandescent bulbs with CFL bulbs to ensure that less heat is generated. By making a few changes within the home and protecting your property against the high temperatures, it will work to keep the interior cool and prevent too much dependency on an air conditioner. The savings will be well worth the minor adjustments for changes that will prove to be effective and eco-friendly on the environment.